Natural light and lagoon views welcome you into this comfortable, second-level, one bedroom villa. Situated right in the popular East Beach neighborhood, this location is unbeatable. A perfect getaway spot! This villa sports an open concept living area, comfortable seating, and a flat screen TV. Easy access to the fully equipped kitchen allows for this villa to make the most of the space. The back screened in porch is just off the living room for you to take in the sights and sounds of the nature and lagoon. The kitchen has everything you might need while on vacation. The bedroom offers a king bed, TV, and a full bathroom access. Mariners Watch Villa’s centralized location makes enjoying the amenities of the island a breeze. The 30 miles of bike trails extend all the way to Freshfields Village. Night Heron Park's green spaces and playgrounds are an easy stroll away. 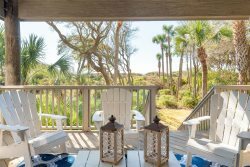 Kiawah Island's beautiful 10 miles of white sand beach is across the parking lot and down the boardwalk! Please note there is no pool access with this villa.